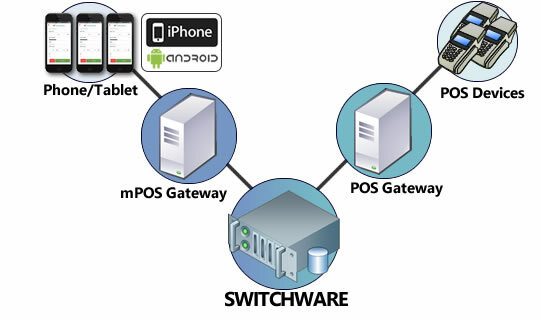 This solution is meant for financial institutions that wish to establish relationships with local merchants and use SWITCHWARE® to support acquirer Point-of-Sale (POS) transactions or Mobile Point-of-Sale (mPOS) transactions at various merchant locations. SWITCHWARE manages all transaction authorization and routing plus POS transaction totals and settlement with the merchants. A recent Juniper Research study found that smartphone and tablet-based mobile point-of-sale (mPOS) terminals will take on a significant role in businesses, handling 20% of all retail transaction value by 2021. The forecast concludes the use of mPOS systems will account for more than one in three point of sale (POS) terminals by 2021, driven by larger retailers adopting mPOS as part of their broader POS options. Regardless of the type or size of business, CSFi-supported mPOS solutions provide a vast array of value-added services and functionalities. If increased transaction speed, business efficiency, back-end reporting and business analytic are important to your customer, CSFi can provide a solution. The rapid adoption of smartphones and tablets as a potential POS delivery channel in virtually every merchant category is a fact. Support of mPOS technology has become an assumed capability of any full service financial institution. Learn more about mPOS here. This solution is meant for companies that wish to establish relationships with local merchants and use SWITCHWARE® to manage the POS terminal totals, reports and settlement functions that are necessary in conducting business with the merchants.